Powers/Abilities: Crustaceans mutated by radiated oil and enhanced by Badoon technology, a typical mutant crab possessed immense strength. Two of them were enough to restrain Namor the Sub-Mariner. (Sub-Mariner I#51 - BTS) - Byrrah had allied himself with the Badoon. The reptilian aliens were after Earth's oil supply and promised to make Byrrah viceroy to their world sweeping Brotherhood of the Badoon if he was able to give them access to the massive oil reserves in the South Pole. When an oil tanker carrying radioactive petroleum products sprung a leak and sank in the Antarctic Ocean, Byrrah nurtured a large group of crustaceans who lived in nearby caves with the radioactive oil to create an army of "mutant crabs". Byrrah figured out a way to use the crabs to further his schemes. Enhancing their limited brains with advanced Badoon technology, Byrrah trained a number of crustaceans as his pets. He also had a small army of them stand guard at the ice coffin containing the body of the Atlantean royal Namora. (Agents of Atlas I#4 (fb) - BTS) - The crabs guarding Namora's coffin possessed implants rigged to wake the crabs as soon as the coffin was breached or tampered with. (Sub-Mariner I#50) - Suffering from amnesia, Namor tried to find solace in the ocean and took off for the Antarctic, almost as if something in his patchy memory drew him there. When he arrived at the ruins of old Atlantis, he hoped the sights would jog his memory. But he was attacked by one of the giant crabs instead. 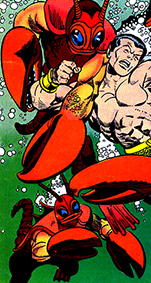 Namor quickly defeated the single crustacean bruiser, but he was then greeted by a large group of the crabs and their leader Salamar (a robot, who was actually remote-controlled by Byrrah). Overjoyed, Salamar stated it was Namor's duty as prince of the realm to return the shattered empire of Atlantis to its former glory. In an attempt to make Namor remember more, the crabs pointed him towards the hidden cave where his, apparently deceased, long lost cousin Namora was kept in an ice coffin. This didn't spark any memories, so the crabs retrieved an Atlantean from the oil pits, claiming it was Namor's other cousin Byrrah. When this also didn't help him remember, Salamar threatened to kill Namor. The Sub-Mariner tried to escape, but two crabs held him down while Salamar surrounded Namor with an electronic prison cell. Namor started to suspect there was more to Salamar than merely the mutated crab he claimed to be. He managed to trick the crabs in releasing him and then ripped Salamar apart, revealing an device that led him to Byrrah's location. 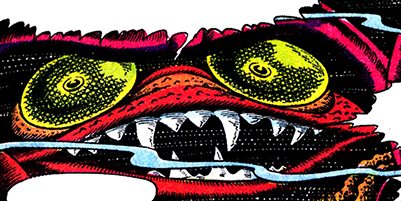 Still, having only suffered a minor setback with the loss of the Salamar persona, Byrrah ordered his "mutant crabs" to bring in yet another cousin of Namor's: the captured Namorita. Seeing her finally restored Namor's memory and the angry Sub-Mariner jumped on Byrrah, ready to kill him. However, Byrrah was stopped by the Lemurian empress Llyra, who desired revenge on Namor as well. Llyra accidentally shot several "mutant crabs", while aiming for the fast moving Namor. In the end, Namor got rid of Llyra by knocking her into an oil pit. (Sub-Mariner I#51) - Namor learned of the crab creatures' origin. Fearing they might be a potential cause of great carnage if left unchecked, Namor planned to destroy all of them with TNT explosives he'd recovered from the wreckage of a nearby naval supply ship. Byrrah once again commanded his "mutant crabs" to attack Namor, but they were surprised by the appearance of Badoon warriors. The aliens had grown tired of waiting for Byrrah to deliver on his promises and arrived to take matters into their own hands, killing everyone in sight, even their ally Byrrah. 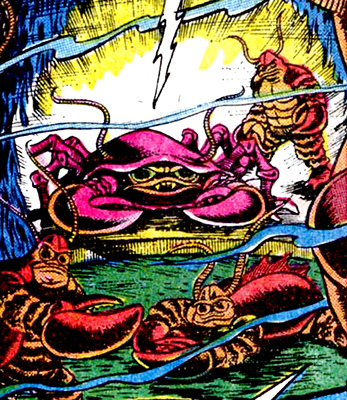 Summoning his crabs to defend himself, Byrrah sent them to oppose the Badoon. However, in the midst of this battle, Namor detonated the TNT, resolving the conflict by allegedly killing all involved parties. (Agents of Atlas I#4 - BTS) - The group of "mutant crabs" ordered to guard Namora didn't get involved in the final conflict between Namor, Byrrah and the Badoon. They continued to stand watch over the ice coffin, but mutated further over the years, losing their humanoid form and reverting into more natural, albeit gigantic, crustacean forms. (Agents of Atlas I#4) - The Agents of Atlas travelled to the Arctic Ocean when their member M-11, the Human Robot, declared there was a 93.7765% possibility Namora might still be alive. Locating the secret cave where she rested in her ice coffin, the team was shocked at first when they saw Namora's withered skeleton inside. However, Marvel Boy used his Uranian technology to detect the coffin was generating a holographic and telepathic projection. He disabled the generators and the real Namora was revealed, alive and well. However, Marvel Boy's tampering triggered the Badoon technology implanted in the crustacean's brains and woke the long dormant "mutant crabs". The Agents were no match for the enormous, near mindless crustaceans and almost perished. Fortunately, M-11 managed to defrost and revive Namora in time for her to come to the team's rescue. With her strength and vitality replenished the instant she hit the water, Namora finished off the crabs by creating a massive underwater maelstrom that trapped the crabs and caused a lethal cave in. Afterwards Jimmy Woo retrieved one of the brain implants, confirming it was indeed of Badoon origin and designed to function as an alarm. Apparently, there was some difficulty deciding on the final look of the mutated crabs. When they first appeared on the cover of Sub-Mariner I#50, they looked more like humans dressed up as crabs than actual, mutated crustaceans. To make matters worse, the cover of Sub-Mariner I#51 depicted a group of characters attacking Namor that never even appeared in the comic itself, nor did they resemble a crustacean in the slightest. Despite being called mutant crabs, their origin makes it clear they are mutates. While training the mutated crabs to serve him, Byrrah also created a large mechanical crab he called Salemar the Sustainer. The Sustainer was modified with an audio amplifier, microphone and a remote control signal unit that allowed Byrrah to control its movements from a safe distance. Acting as the "Mutant Crabs'" leader, Salamar hoped to trick the then amnesic Namor into repopulating the ruins of Antarctic Atlantis with his niece Namorita. When Namor was unwilling to co-operate, Salamar used its technology to trap the Sub-Mariner in an electronic cell. Now suspecting there was more to the crab king than met the eye, Namor tricked him into releasing him. Jumping on Salamar's massive form, Namor ripped open the creature's head and found the remote control device that led him to Prince Byrrah.